BALTIMORE (AP) — Joe Flacco’s sore right hip means Ravens coach John Harbaugh may have to wait until Sunday before deciding who to start at quarterback in a pivotal game against the Cincinnati Bengals. Harbaugh’s options are Flacco, an ailing 11-year veteran; Lamar Jackson, a rookie who’s never made an NFL start; or Robert Griffin III, who’s been inactive every game this season. Rather than fret, Harbaugh attempted to put a positive spin on the situation. 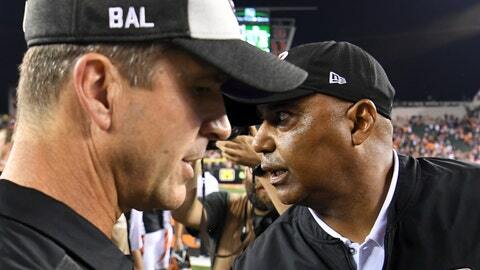 Actually, Cincinnati coach Marvin Lewis couldn’t care less. He’s got his own problems, most notably a horrific defense that set a dubious Super Bowl-era record by yielding at least 500 yards in three successive games. Lewis fired defensive coordinator Teryl Austin on Monday and assumed the responsibility of running the defense with the aid of Hue Jackson , who was hired Tuesday after being dismissed as head coach of the Browns earlier this season. The Ravens (4-5) and Bengals (5-4) fully expected to be in a better place with seven games to go. After a 4-2 start, Baltimore has lost three straight. The Bengals have dropped four of five after opening 4-1. The importance of this game for both teams cannot be understated. Overlooked in the Bengals’ defensive collapse in a 51-14 loss to the Saints last week was how the offense struggled without receiver A.J. Green, sidelined with a toe injury. The Bengals put together a 75-yard touchdown drive on their opening possession, and the starters didn’t score again. Cincinnati wound up with 284 yards. Andy Dalton was only 12 of 20 for 153 yards with four sacks and two interceptions. Green was initially ruled out for the Ravens game on Friday, but the Bengals did an about-face and held open a slight chance he’d play by listing him as doubtful. The receivers know they must do better in Baltimore. Lewis has been coaching the Bengals for 16 years, and Harbaugh is in his 11th season with Baltimore. Flacco has been Harbaugh’s starting quarterback since 2008 , and they’ve won a Super Bowl together. Dalton has a 68-48-2 record as a starter over an eight-year run. The Bengals return to the place where they broke the Ravens’ hearts and made the Buffalo Bills giddy with one big play in the final regular-season game last season. Dalton’s 49-yard touchdown pass to Boyd on a fourth-and-12 play with 49 seconds left sent the Bengals to a 31-27 win that kept Baltimore out of the playoffs and gave the Bills their first postseason appearance since 1999. Bills fans donated more than $450,000 to Dalton’s foundation in gratitude, and the quarterback was warmly received at a preseason game in Buffalo last August. “It was one of the coolest moments of my career, with everything that happened on the play and afterward,” Dalton said. If Flacco can’t go, Jackson will likely get the call. The 2016 Heisman Trophy winner and former Louisville star has thus far been used periodically in running situations and is second on the team with 139 yards rushing. Jackson said it would be “awesome” to start, but has no complaints about this current role. The Ravens are 8-2 following a bye under Harbaugh and an NFL-best 13-3 since 2002 after getting an extra week off.